I met the 21 year old Riccardo Dominguez at my agency in Paris. It’s his first time in Paris and he’s here for women’s fashion week. Q. When and how did you start modeling? A. 4 years ago. I was living in a cool area in Colombia, where photographers and designers live. They offered me to try some projects together and that’s how it all began. But I’ve only started modeling women clothing recently. 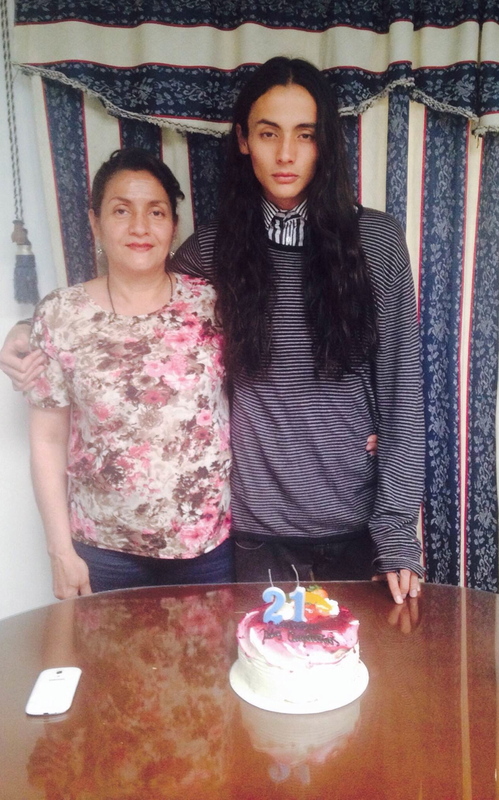 I’m named first androgynous model in Latin America. I’m the first male to wear heels in Colombia’s fashion week. Well that’s what I find when I google myself, haha. Q. Is it hard for you to walk in high heels? A. I never wear high heels, I wear mens clothing. So at first it was very hard, I was practicing a lot. Q. How did your family react when you started modeling female clothing? A. At first it was weird for my parents, my mum didn’t really like it. But then she saw how much press I’m getting and thought it will be good for my future. Now she’s proud of what I’ve accomplished. Q. What’s the best part in modeling? A. Best is travelling and meeting people. I love shoots and seeing myself in billboards later. It’s also very nice to be inspiration for other people. I try to be grateful for everything. A. When people are rude. Some people were really not nice in castings. I saw some mean things published about me too, the usual things that models hear, like “This is not beauty” or “You’re too skinny”. Q. What’s the most difficult? A. When you’re hopeful and really like the designer, but don’t get the job. It’s hard not to take it personally and not blame yourself. Q. What do you want to do besides modeling? A. I study theatre and want to become an actor. Q. Tell me about your life in Colombia and what do you miss? A. I have a boyfriend. We’ve been together for 1 year. He’s planning to come and visit. I don’t know when yet, maybe it’s a surprise. He’s 25 years old, economist. I’m missing my mum, my mums cooking. I can’t cook and eat very badly here, microwaved food. Q. It’s your second week in Paris. What’s the plan after?